So you have decided that you will work out at home. Maybe there is no gym nearby, maybe you don’t have much time or maybe you simply don’t want to be bothered by squat rack curlers and other characters who occupy public gyms. In either case, you now face the challenge of designing your own workout space. 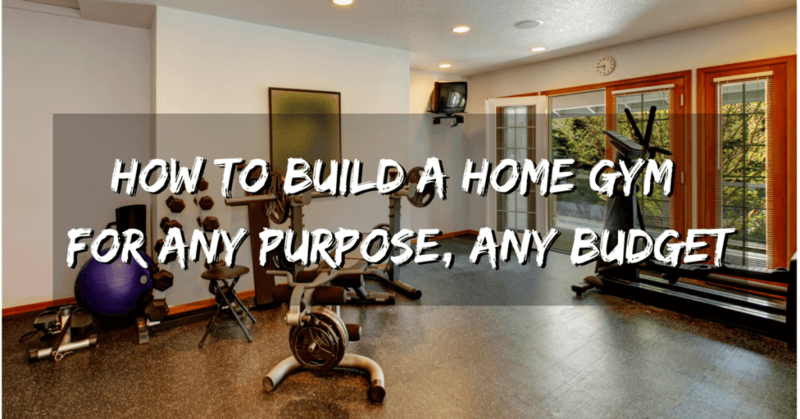 To make this task easier, we have made a thorough guide to building your own home gym for all budget levels: from broke to Scrooge McDuck. Where to Put Your Home Gym? Besides the reasons I’ve listed above, there are quite a few benefits to having a gym right in your house or flat. If you don’t feel comfortable working out in front of strangers, don’t like the music your local gym plays or simply want your gym time to be me-time, a home gym is a great place to escape from the world and focus on overcoming the weights in the privacy of your own home. You’ve just woken up and have some time to exercise. And because you have a home gym, you actually can do it right now without spending time in transit. You can also go to your gym at any time and for as long as you can: if you can’t fit a whole one-hour workout, maybe you can do two shorter ones. The choice is yours. Let’s say you go to the gym and your workout takes one hour. Wrong: your workout takes however long it is, plus the travel to and back from the gym as well as the time you spend waiting on the equipment. In the end, that hour becomes two, or even three very quickly. Don’t like waiting for equipment? At your home gym, this will no longer be a problem (unless you invite friends over). A combination of all the advantages listed above, sustainability is crucial when it comes to any habit, including fitness. If you have to force yourself to go every time when gym time comes, you won’t stick with it for very long. And this is a game of months and years, not days. It takes consistent effort to see great results. Having a gym at your disposal at any time, without other people to wait on, right in your home, is a huge advantage that makes sticking to your workout program much more likely. The first thing you have to consider before getting into equipment is where your new place of gains will be. Do you have an empty room or a garage? With a little bit of cleaning it could become your new fitness sanctuary. Even a small 10’x10’ room is enough for the essentials. However, don’t give up if you don’t have a whole room. If you can get some floor space and if you have a ceiling or doors, you can still get a great workout in. Fun fact: you can train almost every single muscle in your body with exercises that use just the floor. It is far from optimal, but if you really want to go as bare-bones as possible, you need two things: a floor with enough space, a mat and either a pull-up bar or a pair of gymnastics rings. The one thing you can’t train with just the floor is pulling: exercises like pull-ups and rows that target your lats and the whole back. That is why we recommend getting the rings: not only can you do both pull-ups and rows on them, you can also do dips, support holds, muscle-ups and a whole array of advanced bodyweight gymnastics exercises that always have another, harder variation in store and will leave your upper body looking like that of a Greek god. TRX straps are another option, just keep in mind that they are not appropriate for more than rows and pull-ups. A good pair of wooden rings like these will cost you around $50 (plastic ones are cheaper, but still useful) and they can be mounted on the ceiling, a pull-up bar or even outside on the playground or a tree branch. Do you want to lift? The barbell and plates. This is the first and most essential equipment you will need when you are starting your own home gym. If you want to get lean and strong, your training needs to include the big six movements (squat, deadlift, bench, overhead press, row and clean) and guess what you need for all of them – yes, a barbell with weights. How much weight should you get? Around 400 pounds worth of weights will last most people a lifetime, even less can be enough for smaller people and women. The squat rack. Despite the name, the squat rack is useful for more than just squats: you can also use it for the bench press, the overhead press, pull-ups (most of them include a bar) and other exercises. The bench. The barbell bench is one of the most important exercises that you can do and to do it, you will need a good, sturdy bench. Ideally, you should get one that has a sit-up attachment as well, but any well-made bench will do. These are the three things every proper home gym needs to have. With just these, you can do every exercise you need to get a very strong, good-looking lean body. This layout will take the essentials (rack, barbell, plates, bench) and add some very useful pieces of equipment that will complement the bread-and-butter of your home gym. Dumbbells. Dumbbells have the distinct advantage that you use one in each hand, which is great for: ironing out imbalances, increasing the stability demands and changing up the workout stimulus. A weight belt or a weight vest. Push-ups, pull-ups, and dips will quickly get too easy as you get stronger. In order to keep progressing in them, you will need to add additional weight. Since you already have the plates, a chain belt is an obvious choice for the pull-ups and dips, but you may still need a weight vest for push-ups (we’ve put together a guide for choosing the best weight vest for you). A dip station (or a portable dip bar). This goes hand in hand with the pull-up station. Dips, just like pull-ups, are among the best exercises you can do. When you can do a few of them with some added weight, your arms won’t’ look small anymore. A foam roller and lacrosse balls. No, we won’t be playing lacrosse: these balls are incredibly useful for myofascial release, which is a fancy term for rolling your muscles, finding knots and working them out. This is incredibly useful and speeds up recovery, helps prevent injury and sometimes just feels good to do. The foam roller is used for the same purpose, just on the bigger muscles, while the lacrosse ball if for those harder-to-reach ones. You can now hang a sign “Personal Training” outside of your garage and start a side hustle. Many people who travel a lot still want to have a great looking body. Sadly, many of them give up hope of finding a good gym every time they go to another city. But there is no need to do so: just grab yourself a pair of TRX straps and a yoga mat. The (almost) free plan is ideal for anyone who has to get their workout done in a hotel room. Let’s face it: a properly equipped home gym is not going to be cheap. If you plan to buy all of the stuff you decided you need new, that is. On Craigslist (or similar sites) you can often find used equipment, sometimes just a few months old, for a third off or half the price. Also, since a lot of gym gear, like racks, benches, barbells, plates, and dumbbells are made to last forever, you can buy it a few years old at a fraction of the price and still get something you can use for years. If you have a knack for building things and time to do so, you can make almost everything you need by yourself. A rack can be made out of wood, weight plates out of concrete,… The only piece I’d still advise you to buy would be a barbell (you don’t want some steel pipe snapping in your face). A home gym is a great investment that will continue to pay off for years to come. It will make it easier to stick to your training routine, give you peace and quiet during your workout and make going to the gym easy. Whether you choose to go the minimalist route or make a proper training facility, think of it as an investment into your future body that will – over a few years – probably cost you less than a gym membership would. Choose the best home gym equipment for you and your goals. Do you plan to build a home gym? Let us know what you will get in the comments below. Already have one? Share your layout – or even better, share a picture.